Ten years ago I was at Leeds University, starting my first business. Little did I know that I would end up dropping out and moving to London. Also unpredictable was just how many great people I would meet along the way. Amongst the first people we persuaded to work with us (organising alternative careers events) were twin brothers (one in Durham, one in Bristol), Harry and Ed. Both have gone on to do brilliant things and, at the time, both mentioned their cousin Nathalie to me. Nathalie, it seemed, was helping to start a private members club in London, aimed at freelancers and entrepreneurs. If I was interested, they would introduce me. I remember my first visit to Adam Street like it was yesterday. Turning off the Strand in Central London. Being pretty sure that the discreet black door could not possibly be the entrance to a club, but ringing the buzzer anyway. Walking down into the vaults of, to a student, another world. Following a tour and a coffee it slowly dawned on me that they would have no objection to me joining. They even offered me a great rate. Brochure in my hot little hand, I emerged, blinking, into the afternoon chill. I knew I had discovered somewhere special. Somewhere which would go on to be the scene of many great encounters. The year was 2001, and I had recently contacted the founder of Yo! Sushi, Simon Woodroffe. As well as offering to speak at one of our events, he had also agreed to have a beer. He wanted to introduce me to a new contact of his, a chap called Ben, who he suggested he bring along. That beer proved pretty fateful. The location I chose was Adam Street. Simon’s guest was Ben Way, who went on to be my business partner of several years and, to this day, a dear friend. Several years later, having met the most incredible girl one Saturday night, I had managed to line up a date the following Thursday. The starting point of our evening, for a drink and some dinner: Adam Street. What became of the date? Well, we’ve been happily married for two and a half years. Picking up on the buzz, my little (I must stop calling her that) sister began working on reception as a job straight after college. She moved on to University and began a career away from hospitality. Over five years later, just last month, she began a new role, as head of membership. At Adam Street. So Happy Birthday Adam Street. You remain a welcome retreat away from the noise and the haste of central London. You host great events and have quiet spaces for catching up with old friends and meeting new ones. Your library is a haven to escape and relax or work away for a couple of hours. Most of all, a very big Thank You. To James Minter and his family, who own the club. To the whole team, including Andrew Goddard who returned recently as General Manager. Jennie Cox, who remains the best hospitality staff member in London (rivals, please don’t poach her! ), and to all of the team members of the past ten years. Thank you to Nathalie Bristow and thanks finally to Harry and Ed Lawson Johnston. 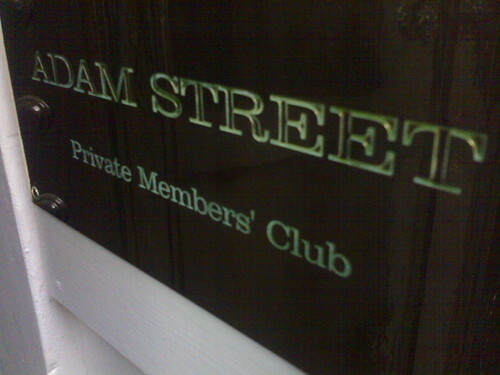 Without the thoughtfulness of that first introduction, Adam Street would have remained a hidden place, behind a discreet door, just off the Strand, in London.